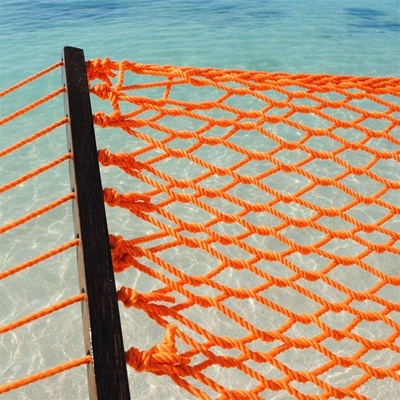 This large Caribbean Rope Hammock is hand woven from soft spun polyester that is very weather tolerant. Unlike a cotton rope hammock, this hammock will not rot, mold, or mildew, resisting bacterial growth and decay. The woven bed is constructed of a continuous weave of a 3ply, 8mm polyester rope that is known for its superior strength and softness. The bed spans 55", making it comfortable for two people. One thousand feet of rope are used to make this rope hammock! The solid oak spreader bars are triple dipped in marine varnish to lengthen the life and durability and provide strength. Hand tied bowline knot tightens with use for added safety. 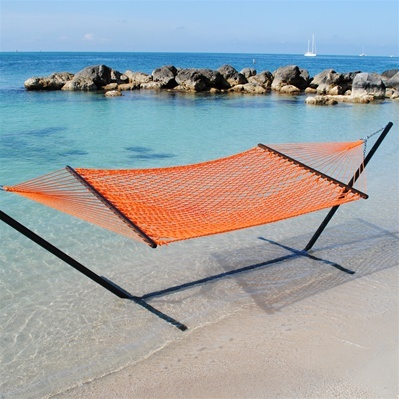 This hammock is easy to hang between any two points 12 ft or more apart. The hardest part is choosing between eleven stylish colors!